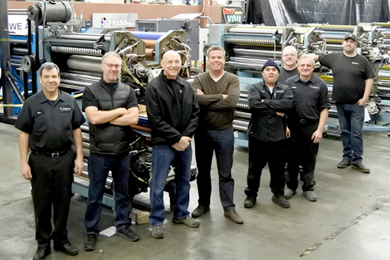 Washington state neighbour The Columbian is expanding colour capacity with the installation of a four-tower press from ImPressions Worldwide. Based in Vancouver, Washington, the newspaper has recently announced a contract to print two titles for the Puget Sound market. ImPrtessions is supplying the four-tower, two-folder Goss Community SSC single-width press in what it calls a CPIR - for clean, paint, inspect and repair - contract. Production director of The Columbian Cris Matta says the publisher is committed to continually advancing its technology to accomodate customers' emerging requirements. "Given the changing world of print and digital media, this investment not only supports our ability to execute the recently announced print contract for two Puget Sound-area newspapers but also positions us to get back into commercial printing." Work on the press has started at the supplier's headquarters north of Seattle, with delivery and installation to follow shortly.